Cairo has become one of the ten most dangerous places to work as a journalist. 75 journalists have been physically attacked and 81 imprisoned since February 2010, according to Reporters Without Borders (RWB). Mohamed El Sayed, assistant editor for the Egyptian and Sudanese affairs newspaper Al Hayat, was one of the journalists to face the dangers of being in the epicenter of the uprising in the Egyptian capital in January 2011. “We were chased by the regime, police, and military agents especially the first days of February 2011. I was detained for 17 hours with a couple of journalists in a school at the beginning of the Egyptian revolution”, explained Mohamed. Some journalists were hounded, harassed, and imprisoned without evidence during the first days of the uprising. However, a year after the first protests in Tahrir Square, the situation has not changed much. “I went back to Cairo for a week on the first anniversary of the uprising and the situation was the same. We were surrounded by military and police agents and they tried to harass journalists and activists”, affirmed Mohamed. These repressive methods have contributed to Egypt’s fall in the Press Freedom Index 2011-2012 released by RWB. Egypt fell from 127th to 166th. The departure of the Egyptian President, Hosni Mubarak, has not meant the fall of the entire infrastructure that supported the regime. 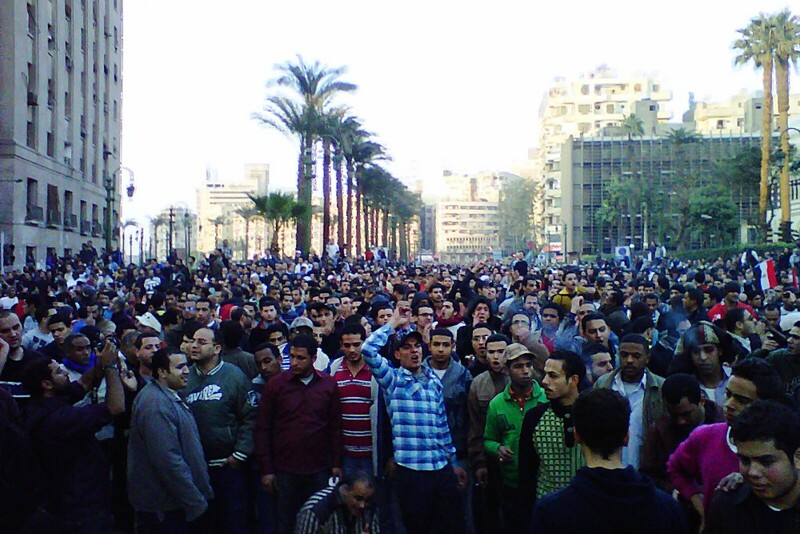 Some critics state that the military is using the same old methods of censorship and intimidation of Mubarak’s regime. The Supreme Council Army Forces (SCAF), which replaced the rais and will hold power until a new president is elected, has taken over the state media. A few months after the revolution, people demanded the departure of those who were part of Mubarak’s regime in the public media. “The SCAF changed them but replaced them with military correspondents. 4 out of 7 state media chief editors were military correspondents who had long careers in the institution,” explained Mohammed. However, not only journalists are being targeted, but also netizens who use internet to give their opinion. Both groups have been prosecuted before military tribunals for “insulting the army” or “spreading harmful information”. Egypt’s Penal Code and press law establishes prison and fines not less than 5000 Egyptian pounds (£530) if they are found guilty. Some analysts believe that these terms are vague and they are used as a tool to prevent public criticism of the government and the military. “Now, there is to some extent press freedom, more than Mubarak’s period, but still restricted to critics to the SCAF”, affirmed Dr Mishrif, from King’s College London. Maikel Nabil, an activist who had a blog about the military, suffered the consequences of criticizing the army. “He spent 10 months in prison and was condemned for two years. He was pardoned at the end of January after huge pressure from the political factions in Egypt,” explained Ahmed Kazi, journalist and activist. The post that caused his prosecution can be found in Nabil’s blog. He wrote on March 2011, “the army did not stand by the people’s side, not even once during this revolution and that the army’s conduct was deceptive all the time and that it was protecting its own interests”. Even though, journalists and citizens know the consequences if they cross the red lines, they have not silenced them. “Everyone in Egypt is talking about politics and the situation of Egypt. People express their concerns and fears about how the SCAF handles things in the country. Regardless of what the regime is doing people are participating actively”, affirmed Ahmed. Egyptians have engaged in political debates that take place not only in the streets, cafes, and universities, but also on Facebook and Twitter. The social networks were important channels to spread the revolution and gather people in Tahrir Square at the beginning of the uprising, but also now after a year of the revolt. “It has become a good channel for activists to communicate and to spread what happens in any inch of the country. The social media is playing a vital role in keeping the revolution going on”, stated Ahmed. The social network has, therefore, become an important tool for communication and also a paramount source of information. For Mohammed, “twitter is at the moment the most credible source and keeps you updated all the time”. The military has also seen the useful side of the social network. “They have a Facebook page that is used as the only channel of communication between the army and the people”, affirmed Ahmed. The popularity of the social network in Egypt has situated the country with the highest number of Facebook users in the Arab world. Facebook had over 4 million Egyptian users in November 2010, now has over 9 million. Social networks have converted into a new agora where to discuss and inform about what happens in the country, where the Egyptians keep demanding the reform of state media and the fall of prison and fine for criticizing the army. ← Tourism industry in the Mediterranean “paradise”: Can there be limits to aggressive growth?